15. 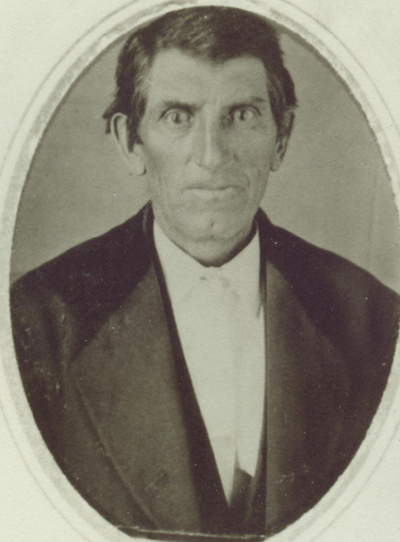 Jeremiah Littleton3 Cox (Joseph2, John1) was born 13 October 1818, at Abington in Wayne County, Indiana. He was killed on 12 September 1882 (age 63y, 10m, 25d gs) at Port Byron, Rock Island County, Illinois when his load of wood overturned on him. Jeremiah, known as Jerry, married Mary Freeland on 13 October 1839 in Rock Island County, Illinois. Mary was born on 19 August 1817 in Ohio, a daughter of Luke Freeland and Ruth Thompson, and died on 21 April 1902 (age 84y, 8m, 3d gs) in Rock Island County. Jerry and Mary are buried at Fairfield cemetery, Rock Island County. Jerry was a laborer residing in District 37, Rock Island County at the time of the 1850 census. On 27 October 1855, Jeremiah was a class leader at the first quarterly meeting conference for the Port Byron Circuit of the Methodist Episcopal Church. He was also on the earliest list of members of the Port Byron Methodist Episcopal Church, dating from 1857 (S20, p. 102). In 1860, Jeremiah was a farmer in Coe township (T19N, R2E), Rock Island County (P.O. Port Byron), with real estate worth $800 and personal estate of $350 (census, p. 460). On 19 April 1861, Jeremiah L. Cox, age 42, enlisted at Rock Island for a three month term as a private in Company D (Capt. Williams) 12th Illinois Infantry. The Rock Island Argus of 31 May 1861 mentions him as a member of Capt. Benson's Company (age 42). He was mustered out at Cairo, Illinois with the rest of the company on 1 August 1861. A year later, on 11 August 1862 at Coe township, Rock Island County, he enrolled, at age 44, for a three year enlistment as a private in Company G, 126th Illinois Infantry, and was mustered in with the rest of the company at Alton, Illinois on 4 September 1862. The bounty payable for the enlistment was $600, of which $75 was due when he was mustered out. Jerry is listed on the muster rolls as present with the company until June of 1864. In February 1864, his son Pleasant, age 19, enlisted in the same company. On 2 June 1864, Jerry was detailed as the Post Carpenter at the post in DeVall’s Bluff, Arkansas, and remained in that capacity until about March or April of 1865, when he rejoined the company and was present when it was mustered out at Pine Bluff, Arkansas on 12 July 1865. At that point, he had last been paid through 28 February 1865 and his clothes account had last been settled on 31 August 1864, since which time he had drawn $44.29 in clothing. He also owed the government $6 for arms and equipment. J.L. Cox of Coe was a delegate to the Republican County Convention in 1866 (Rock Island Weekly Union, 1Aug 1866). The Rock Island Daily Argus of 5 September 1873 mentions him in connection with a Rock Island city criminal case. An 1877 biographical listing of J.L. Cox shows him as a farmer, residing in section 19, Coe township, P.O. Port Byron, a Republican and Methodist, owning 80 acres worth $4,000. (S17, p. 405). Jeremiah was a farmer in Coe township in 1880 (census, p. 251B). At his death in 1882, Jeremiah owned 50 acres of land worth $1500 and had personal property totalling $1,210.80. The latter included an old light gray mare, a dark gray gelding, an old light bay gelding, a gray colt, 4 red cows, 2 spotted cows, a roan cow, 7 spring calves, 3 yearling heifers, 1 sow and pigs, 50 sheep & lambs, 15 shoats, 10 small pigs, a farm wagon and spring wagon, an old bob sled, a cultivator, a reaper, two plows, a barley rake, another rake, a one half interest in a corn planter, a 4 tine fork, a 2 tine fork, a shovel, a set of double harness, 70 bushels of oats (@25¢ bu. ), hay in the barn, a buffalo robe, 34 turkeys (@40¢ each), chickens, an iron kettle, apples in orchard, a grind stone, ax, 10 grain sacks, cooking stove & fixtures, kitchen table, 7 tin pans, store jars, coffee mill, 40 glass jars, butter bowl, barrel, Dubuque soft coal bin burner, clock, mirror, 6 kitchen chairs, 1 rocking chair, 8 chairs, stand & cover, lounge, 2 rag carpets, lamp, bed stead, bureau, ward robe, cl press, 3 feather beds & bedding, 3 bed steads, crockery, glass set, small scales, 3 sad irons, wash bowl & pitcher, lamp, 2 sets of knives & forks, 30 bushels of potatoes (@30¢ bu. ), 1 hay rack, and 15 acres of corn in field. His probate petition names Mary Cox, widow, and Caroline Cox, David Cox and Pleasant F. Cox, his children, as his heirs.